Today's selection is Jonwayne's 'These Words Are Everything;' a dope title and concept, with production by DIBIA$E. The song is featured on 'Rap Album Two' and is ‘an introspective look into what music means to him and his refusal to sell out for the sake of profit.’ (DX) Adding wordplay and sonic visuals to his already introspective lyrics, ‘Rap Album Two’ is one of the best releases so far this year. Thinking back, I have to credit L'Orange for unknowingly putting me on to Jonwayne in a tweet a couple years ago - I've followed Jonwayne's music ever since. Doing something you love while trying to make a living from it is a familiar battle that'll surely resonate, but it's not his only battle. 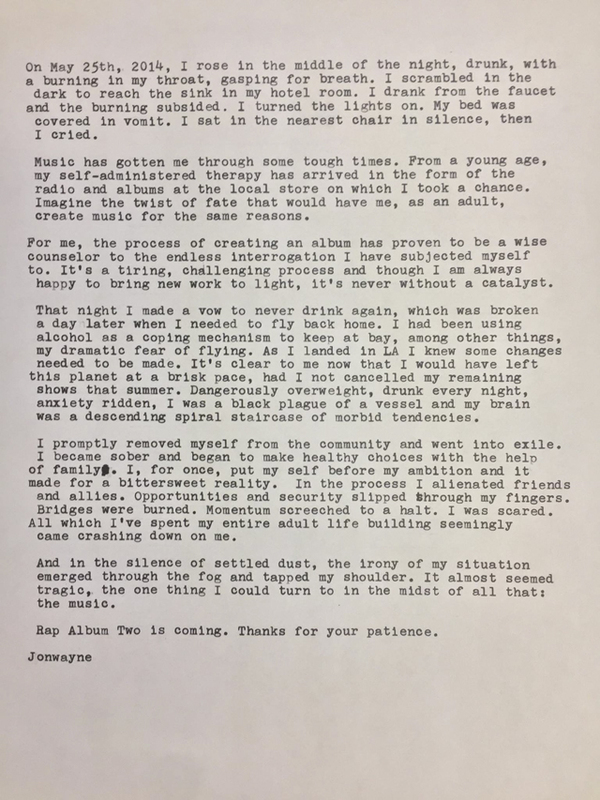 The letter above was shared with his fans via FB & provides more back story on the power of music, the role it plays in his life, and his sobriety moving forward. Order 'Rap Album Two' HERE.